Stunning setting, own garden terrace. Enjoy mountain and sea views of the exclusive bay of Eze with its celebrity residents and super yachts from your private garden terrace . This modern apartment is situated in quiet residential area only 300 metres from the beach. and short walking distance to train, bus, restaurants. 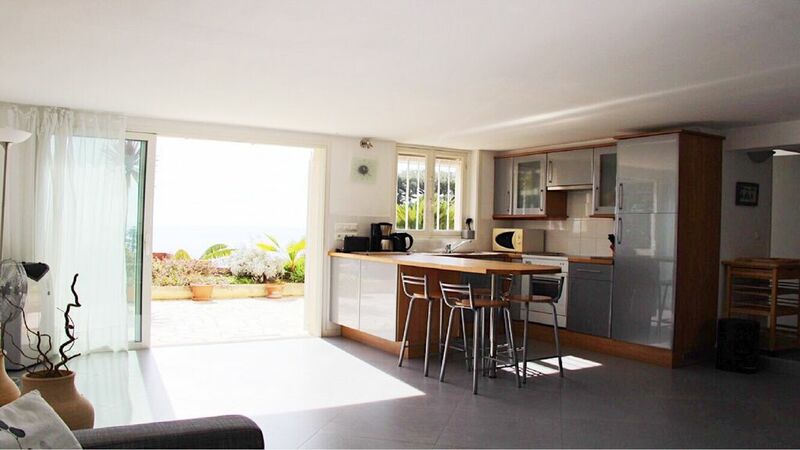 Ideally placed for exploring the area -5 mins drive to Beaulieu and St Jean Cap Ferrat. 15 mins to Monaco 30 mins Nice, 40 mins to Italy. This newly renovated 60m2 one bedroom apartment sleeps up to 3, is fully equipped and has easy parking. Owners or agent available in village to assist you. We can arrange a trip for you on a private 36 ft sailing yacht at certain times of year. Eze with its mild climate is a year round destination, you can lunch outside on the sunny terrace most days of the year. The lovely coastal and mountain walks are best enjoyed outside the hotter months. large private terrace with sunbeds , sunshades, dining table and full sea view. We loved this apartment, the location is stunning with great views over the med. The apartment is furnished to a high standard and is very clean. It was nice to have well stocked cupboards with all the basics and Nicola was kind enough to to supply us with extras as we arrived after the shops had closed. We found Nicola to be delightful, so helpful but not intrusive, and we loved her dog! The location is really good, close to the station if using the frequent train service, there is lots to see along this part of the coast. We will definitely return before too long! The apartment is very well equipped and ideally located to explore this stunning coastline. We depended on public transport and the bus service to Nice, Monaco, Menton and Eze Village is excellent. The view of the mediterranean from the apartment is stunning. Nicola and Egill's hospitality is exceptionally good. They did everything they could possibly do to make our stay comfortable and homely. The starter pack to get us going, assistance with the first shopping, pickup from the railway station and drop off at the airport - everything that we can wish for. Nicola was always there to answer our questions without being in any way intrusive. It is a difficult task to perform as they live upstairs. There is independent access to the apartment and the apartment is very private in spite of the owners' proximity. (3) Explore the Old Town (Vieille Ville) of Nice and indulge in Niçoise food and wine. Will we go back to stay in Nicola and Egill's apartment? Hell, yeah! Anyday of the year! Wonderful Stay in Executive Bord de mer. The location between Nice and Monaco was fantastic! Easy access to so many parts of the Riviera. The views from the apartment terrace were just spectacular. The owners lived upstairs and we're very helpful whenever we needed it with information and advice. Highly recommended! Perfect apartment in a stunning location! We've just spent a lovely relaxing week at Nicola's apartment. The location is absolutely perfect for exploring this stunning coastline. We didn't have a car but buses were only 1.5euros to Monaco, Nice, Eze village etc. The apartment is extremely well equipped from beach towels and mats to insect repellent! Patricia kindly took us to the supermarket on our first day for supplies. The terrace is absolutely gorgeous with lavender, lillies etc and is the perfect spot for some lunch or a glass of rose in the evening whilst watching the yachts in the harbour. Nicola answered any questions I had before arrival, arranged a pick up/drop off at the airport and left a welcome back of the essentials and a bottle of wine! We throughly enjoyed our stay and hope to visit again. Thanks Nicola for a lovely holiday. Eze Bord de Mer is stunningly located with a backdrop of mountains overlooking the bay of Eze. It has a simple beach,and local restaurants. Free musical concerts are held in the village in summer The owner can also arrange a sailing trip on a private yacht at certain times of year. All year round sunshine means you can enjoy beautiful walks in the mountain and coastal paths, the mountain top village of Eze being a must see. Venture over the Italian border for lovely markets. The attractions of Monaco and Nice are close by as are the famous gardens and art museums of the Riviera In winter ski slopes are little more than an hours drive. Public transport is excellent and cheap. Although close to the more famous haunts of Monaco and Cap Ferrat, with their designer shops, clubs & restaurants, Eze is much more low key. In summer and in the Grand Prix you can have fun celebrity yacht spotting from the terrace. Bono of U2 has a home in Eze, Bill Gates, Roman Abramovich, are frequent visitors.